Today two football teams will be facing each other; at the end of the day one will rise victorious and the other defeated. The champion is the one who overcomes the challenges the opposing team will throw at them. We all face challenges in life. In order to move forward in life, you must overcome challenges. You either overcome them or get overcome by them. 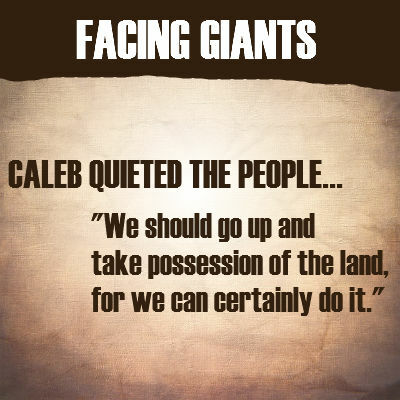 Giants were impeding the Jewish people to go and take possession of the land God had promised to them. That was what was keeping the Israelites from enjoying their inheritance. After 2 years and about three months Israel made it very close to the land of the promise. (Nu.10:11). God commanded Moses to send out spies to inspect the land. Twelve men from each of the twelve tribes. They were to spy out the land for 40 days and bring back report. Numbers 13:25-33 tells us about the report at the end of the 40 days. Israel was this close to their prize, their inheritance. – Descendants of giants live there. – Amalekites, Hittites, Jebusites, Amorites and Canaanites. Giants and many wicked nations came between Israel and their prize. Israel would have to face these giants if they wanted to possess the land. – We can’t do this, they are stronger than we are. They lied about the land (the land that we explored devours those who live in it) and it is infested by giants. Nephilim. We seem like grasshoppers in our own eyes and theirs. They were afraid. Why are God’s children afraid? – They had forgotten who they were; they forgot to whom they belonged. They looked at the challenge, giants and saw them greater than their God. When we experience fear is because at that moment we are not looking at the challenge or circumstances through God’s eyes, but ours. We forget that our God, the same God of the Hebrews is bigger than any obstacles we could possibly face. Fear paralyzes you. It did this to the people of God. It made it rebelled against God (14:1-2) They wept aloud and grumbled against their leaders Moses and Aaron. Fear made them wish to die in the dessert (14:2); they wished to go back to Egypt, the very place from which God delivered them. They wished to be slaves again rather than moving forward. They were stuck. Wouldn’t it be better if we go back to Egypt? Let’s choose a leader. This is very dangerous attitude the people of God displayed here. Joshua and Caleb tore their clothes as if they were telling them don’t do this. This was an act of disagreement. Joshua and Caleb are not in agreement with what they nation wants to do. When facing giants in life you must always remember who you are. Israel’s identity was found in Yahweh (The LORD). They had forgotten that. God was the one fighting Israel’s battles. The nation of Israel was afraid because they forgot who they were. – If the LORD is pleased with us, he will lead us into the land, which he promised. – Only do not rebel against the LORD. – Do not fear those people, giants, they are bread for us (we will devour them); they don’t have any chance (their protection is gone), but the LORD is with us. Joshua and Caleb had their confidence in their God; they knew the LORD is bigger than any giants they could possible battle against. This is why they said, their protection is removed. They are the one who are going to need protection, for we have the LORD. When facing giants in your life, you must always trust God. – It is your trust in the LORD that will give you courage to face any challenge. It is your trust in God that gives you confidence and peace. It wipes out fear from your system because you are secure in his hands. They tried to kill Joshua and Caleb right in there, (v.10) but the LORD intervened. He showed up at the camp and was ready to wipe out the whole nation of Israel. This is how angry God became with the nation of Israel. Israel did not trust God’s word and promises here. They were afraid to go where God was leading them. Moses saved the people that day from the wrath of the LORD. God forgave them, but their rebellion had some drastic consequences. 40 years of wandering in the desert. If you want to experience God’s blessing in you facing giants today, you must always trust him. God brings victory to those in whom he delights, those who obey his word. Israel forfeited the blessing here because of their unbelief, their lack of trusting their God. Can you identify the giants in your life? Those things keeping stuck; what is keeping you from going where God wants you to go? Giants! If you are experiencing fear and insecurity in your facing giants, the LORD has a word for you. He is saying to you, “Why are you not trusting me?” When your trust is in the LORD there is no room for fear. Joshua and Caleb trusted their God; they knew the LORD is greater than any challenge they would face. Do you truly believe your God is greater than the issue you are dealing with right now? Our God is greater, He is stronger. He is able. You see, if God is truly your light; your stronghold. Then you will have the confidence of these men. I pray that our faith our trust in God be more than anthems, or just something that we say. I pray it becomes real; it becomes evident in the confidence we display in this life because we belong to Jesus. Yahweh is our God; the same God of Moses is our God and he is Almighty. If He is with us, nothing can come against us. Amen. I don’t know about you, but I am ready to face those giants.